This page will contain links to other websites, such as news paper articles, about 6 over 60 riding across America for Wounded Warriors. ublished: Sept. 3, 2013 Updated: 9:46 p.m.
Five of the 6 Over 60 Ride Across America cyclists take a dip in the Atlantic Ocean on day 55 after biking from Astoria, Ore., to Portsmouth, N.H.
Before they left town more than two months ago, six friends in their 60s were itching for adventure and the open road. Five of them – Pat Cavanagh, Ed DeMar, Dale Lawrence, Tom Nelson and Jim Webber – set out with their friend Dave Arnesen, 74, who drove the 29-foot RV trailer. The sixth – Darryl Miller, who led the yearlong planning process – stayed home to nurse an injury. 55: Days on the road, including 49 biking days and six rest days. 112,000: Total feet of climbing. 23: Days when the troupe welcomed visitors. 29: Blizzards (ice-cream dessert), or the equivalent of a Blizzard, consumed by each rider. 280,000+: Total number of calories that each person burned on the trip. The plan was to bike across America to raise money for the Wounded Warrior Project – and drink as many Blizzards at as many Dairy Queens as possible. Somewhere along the miles of empty road during the long hours rereading lines of scripture on a notecards taped to their handlebars, the five friends came back humbled, they said, by the generosity of strangers and the beauty of God’s creation. Look inside for some of their stories from the road. Under partly cloudy skies at 10:30 a.m., the five riders set off eastward and out of Astoria as officers blocked traffic for their start. Astoria Police Chief Pete Curzon happens to be friends with Irvine Police Chief Dave Maggard. On the day they left, Curzon gave the riders an Astoria police patch and asked them to take a photo with it whenever they found an officer along their way and then mail it back home. Arnesen encounters Wendy and Clark Reames, who open up their home for the riders to stay the night. For dinner, the couple serves up spaghetti with elk meat sauce. The Reames head out for work at 7 a.m. and leave the riders alone in the house. Standing in a grocery store, laden with bags too heavy to walk back to the campsite, Arnesen holds a $5 bill in the air. “I’ll give $5 to whoever will drive me back to the campsite,” he says. A shopper named Larry takes up the offer but remembers that he had biked to the store. So Larry bikes home, comes back in his truck, takes Arnesen to the campsite and drives home again. Larry – who was homeless for four years, until, he said, he found God and put his life back together – returns a little later with a guitar and plays Christian songs all night as the riders eat dinner. An elderly woman rolls up to the RV to greet the riders. She’s 72 years old, she says, and still working a paper route. All five of her boys served in the army and all came back alive. She pulls out five $1 bills. “This isn’t a whole lot, but it’s what I have,” she says. Co-founder of a local cycling club, Jim Hirz got the call from a friend who had heard a radio story on the riders broadcast out of Mount Hime radio station. Hirz, a former bike racer himself, meets the group 20 miles away from home. You guys are coming to Casper, he tells them. The riders learn that Hirz’ son Dex, 19, was stationed in Afghanistan and now San Diego; his older son Kramer, 25, is a firefighter. Hirz’ close friend’s son-in-law John Jones was stationed in Iraq as a staff sergeant in the Marines. One morning, his Humvee was hit with an anti-tank mine, blowing him through the vehicle roof 25 feet into the air. Some 30 surgeries later, Jones now wears prosthetics and is missing both legs below the knee. He’s also the proud husband of Amber Jones, whom he married in the hospital when he returned to the States. Hirz and his cycling buddies take the riders along back roads the next day, avoiding major road construction nearby. At 9 p.m., the mountain lights up the faces of presidents past. About 100 veterans are invited down to the stage to introduce themselves. People chant “U-S-A.” The riders say they are astonished how patriotic the country is outside of Southern California. Early in the morning, the riders stop on a little rise in the middle of nowhere, thinking of calling Miller. The guys often called him while on the road, or for morning prayer. As they gaze across the open landscape, a figure rides a bike toward them. “Hey, it’s Darryl!” one of them says jokingly, referring to their Darryl Miller, the friend whose broken hip kept him from making the journey. The rider reaches them and introduces himself: Daryl Schubert. The guys are shocked. An interim Lutheran pastor at three small towns in the area, Schubert is on his way back from a town 25 miles west. He rides the next 15 miles with them. Twenty-four coffee mugs and a bottle of whiskey sit in a wooden case at Glen’s Bakery and Deli in a town of less than 5,000 people. Each mug bears the name of a World War II veteran. Some mugs also have dates assigned. Above them, “Last Man Club” is inscribed in the wood. Of the 24 men who met for lunch every day at the bakery, only nine are still alive today – each hoping they’ll be the last one to stick around and get that bottle of Booker’s Kentucky bourbon whiskey. A handful of them grab lunch with the riders, laughing and smiling. One of them is Warren, 92, fought in the Normandy invasion – he’s also known as the Candy Man for the bags of chocolate he hands out to veterans. His son is a successful businessman in the area who made a memorial for past military. At the memorial sits a sculpture of an old military man with a cane. The riders swear it looks just like Warren. But he denies it. Land of Memories RV Park, Mankato, Minn.
Two young boys on bikes hand the guys a $100 bill at their campsite. “My dad wanted you to have this,” one says. The riders search for and find the dad, who has a prosthetic leg – the result of an industrial accident. He’s fully mobile now, playing volleyball with the boys. The guys notice that he doesn’t really appear to have $100 to give. But he says he owes a lot to Wounded Warriors and veterans in general because of the advancements that have been made with prosthetic limbs. And finally, they’re there. Friends and family greet them after two months that seem more like five. After days of climbing steep hills, weathering rain and extreme heat and sleeping on floors, cots and strangers’ beds, the riders dip their front tires into the Atlantic Ocean. “I’m going in,” Webber says, and then all five guys are in the water. They start chanting Arnesen’s name, the RV driver. The 74-year-old strips off his jeans, shoes and long-sleeved T-shirt. Wearing only his tight black underwear, Arnesen wades into the water. An ice cream truck pulls up for a last treat, as though it were expecting them. 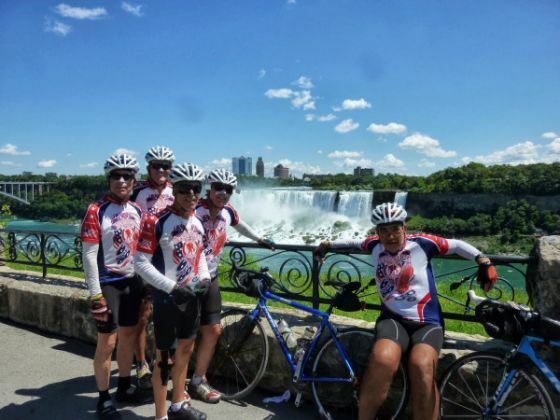 A group of longtime friends is making the trek across America to support wounded veterans. Some see the adventure: six guys in their 60s, hitting the open road to bike 3,600 miles across the country, skipping the big cities to wake up every morning in a small town they’ve never visited before. Some just think they’re crazy. Together they’ve battled abdominal pains, knee surgery and a broken hip to prepare for a trip that much younger men would struggle to accomplish. Every day for the next two months, they’ll cover 75 miles, burn more than 5,000 calories and stop to rest every 20 to 30 miles. “Wherever the Dairy Queens are,” said Ed DeMar, 67. All empty nesters and graduated from their careers, the six Irvine friends know they’ve been blessed with health, family, stability and now, the time to hit the bucket list. They just needed a reason. Three of them served their country, grateful for the health that many other veterans cannot share. So the group dedicated their ride to Wounded Warriors, thinking they would raise what they could for a cause they all believed in. More than $70,000 later, it seems a few other people believed in them, too. It’s been one long year and more than 5,000 miles since the six musketeers began planning their trip. But their journey together started much earlier and includes a few other close friends. Pat Cavanagh, Ed DeMar, Dale Lawrence, Darryl Miller, Tom Nelson and Jim Webber live in the same community in Irvine and attend Voyagers Bible Church. A few raised their kids together, and Cavanagh’s daughter is married to Nelson’s son. “It’s a pretty unique fraternity we’re in,” Cavanagh said. Cycling is the seventh friend in their fellowship, the fun one that’s kept them as active as they were when they were 20. It was only a matter of time until someone floated the idea of biking across the country. A year ago in May, the group started meeting each week to plan the logistics. Starting June 19, they’ll take the northern route from Astoria, Ore., to Portsmouth, N.H. They’ll ride 75 miles each day for nearly two months, resting every sixth day.At an early meeting, they quickly agreed that they should ride for a cause. Given their age and the times, Wounded Warriors just made sense. Most men their age, they explained, either served in Vietnam or have a friend whose name is etched on the Vietnam Veterans Memorial. And most men their age had a dad who fought in World War II. Nelson, whose biological and step fathers served in World War II, recently came back from a trip to France, where he visited the U.S. cemetery in Normandy. No matter what side of the political spectrum, veterans’ health is growing on the American conscience as more troops return home from Iraq and Afghanistan. More active duty soldiers die from suicide than combat, according to the Department of Veterans Affairs, and 22 veterans commit suicide every day. For every U.S. soldier killed in Iraq and Afghanistan, seven were wounded, according to Wounded Warriors. The six riders are a bit of a wounded warrior group themselves: Nelson is recovering from abdominal pain, Lawrence from knee surgery, and Miller will be sitting out after he broke his hip and separated his shoulder on a training ride when a car cut them off. Even though Miller can’t ride, his bike will make the trip in the group’s 29-foot RV trailer, while he meets the team at the other end with fans, family and friends. The team has met every week for the last year, delegating tasks and dividing the route into six sections for each rider to research. On weekends, they contact chambers of commerce, set up accommodations, make promotional materials for local newspapers and update their blog in preparation. Dieting hasn’t really been one of those tasks. Although they’re fairly healthy eaters, riding 40-60 miles three days a week means they don’t have to worry about enjoying burgers, beer and whatever else they’re craving. “Well, Tom went to France and ate pastries for two weeks,” Cavanagh said, jokingly. Some days they bike for three hours to Huntington Beach Pier and back, or up to Santiago Canyon. Their favorite destination is a Pizza Port 70 miles away by the Amtrak station in Solana Beach. Since the trip isn’t a race, there’s no need to push too hard to stick to a schedule. And with the trailer, which can sleep six if needed, they can ride light. Avoiding the big cities along the way, they’re hoping to see parts of the American landscape they wouldn’t normally see from a car and get to know some of that small-town hospitality. Jesus is the eighth friend in the group, the steady one whose plan and presence guides and reassures them. It’s hard leaving behind their wives and elderly parents for such a long time, when any number of things could go wrong at home or abroad. Their children worry, too, especially Cavanagh’s. Two years ago, his son Paul set off on a similar a cross-country ride with three friends. Cavanagh rode with them to the county line at Green River Golf Club in Corona, bought the boys lunch and said goodbye as they sped off along the southern route toward Florida. Then, in Arkansas, three quarters of the way to their destination, Bill Crenshaw was struck from behind and killed by a truck. The memory is still raw. The six friends are taking precautions with their large truck and trailer, blinking lights on the bikes and rearview mirrors on their helmets. But they’re more willing to take reasonable risks as long as they know God is with them. Every morning on the ride will begin with prayer, and as they coast through the miles, a voice may whisper to them along with the wind in their ears. Mr. Solid: The youngest of the group, Cavanagh is the fund-raising extraordinaire, the guys say. Occupation: Worked in real estate development for Prologis for 13 years, and before that as a commercial real estate broker with CBRE for 16 years. Was going to retire a few days before the ride, but he’ll keep working part-time when he comes back. Military: Has not served, but his father was a World War II Army veteran. Biking: Started riding recreationally 37 years ago, but it was taking a lot of time, so he stopped for a while. Started riding again with the guys five or six years ago now that the kids are grown. Mr. President: A longtime leader in the community, Miller served on the Irvine Water District Board for more than 20 years. He’s the team’s organizer and cheerleader, and the guys say he’s a natural leader in a quiet way. Occupation: Retired geologist and municipal water resource and management leader. Military: Air Force reserves medic from 1967-1973 in California and Utah hospitals. Biking: Got his first 10-speed bike when he was 10. Started biking again 20 years ago and rode to San Diego. A runner his entire life, Miller stopped running last year and took up biking as his main activity. Mr. Multitasker: He can do it all; he can bob and weave; he’s the glue of the group, and he’s always positive and optimistic, the guys say. Occupation: Retired educator and former principal of Woodbridge High School. Military: Has not served, but his biological and step fathers served in World War II. His high school football teammate was killed in a helicopter crash in the Vietnam War. Biking: An athlete growing up, Nelson was introduced to biking by a good friend. Mr. Optimistic: He can get the rest of the crew to go on a ride when they don’t feel like it. Occupation: Retired after 30 years in the oil industry, mostly with Unocal. Military: Served in the Marine Corps from 1966 to 1968 and four years in the reserves from 1968-1972. He had planned to take a road trip around the United States with his best friend from high school Ray Burbage, who was due to be discharged in fall 1968 but was killed Feb. 21, 1968. Biking: Began riding with Nelson and Lawrence 20 years ago as running started to get to his knees. Mr. Mechanic: A behind-the-scenes player, he’s the quieter kind of guy who built the team’s website and fixes the gear. Occupation: Retired after 43 years as a computer software manager and developer. Military: Has not served, but family and friends have, including a retired friend who recently returned from a tour in Iraq. Biking: A guy who worked for him 30 years ago was into cycling and racing, and the pair would ride for an hour and 30 minutes during their lunch hour. (That way the other guy wouldn’t get into trouble because DeMar was with him.) DeMar also used to race in Long Beach and Orange County. Mr. Enforcer: He’s the security for the group, the tough guy with two artificial knees who still wants to ride across the country. Occupation: Retired after 25 years as an Irvine police officer. Military: Served in the U.S. Army from 1964 to 1967, including 14 months in Vietnam. Biking: Started riding in middle school to Huntington Beach and took up long-distance cycling when he got out of the Army. Lawrence often does century rides, or 100-mile rides, and participates in the Project 999 Memorial Bicycle Ride in which law enforcement officers ride from Sacramento to Santa Ana to honor officers who died in the line of duty. Tom Doran’s favorite cause is Wounded Warriors. After he heard about the ride across America, Doran, the owner of The Helmet Man, which sells head protection for power sports, gave each of the riders a free helmet. Aric Homesley, a graphic artist and neighbor of Ed DeMar, designed the team’s jerseys and printed them through Voler, a cycling apparel website. Splashed across the chest and back in red, white and blue, the design includes the group’s title “6 over 60 Ride Across America” with a bald eagle soaring in front of a flaming American flag. Front and center is the Wounded Warriors logo – a service member carrying a wounded comrade, slung over the shoulder. The team’s route and sponsors are on the back. Homesley’s jersey design was repurposed for the truck and trailer wraps, done on a discount by Sticky Fingers Design. There’ll be no shortage of fuel on this trip – at least for the truck. Thanks to friends of Jim Webber, who worked in the oil industry for 30 years, Philips 66, Senergy Petroleum and Tyree Oil are taking care of all fuel costs for the entire trip. Training for a cross-country trip takes a toll, so Dale Lawrence’s longtime friend Dr. Ken Yoshino of ACIC Physical Therapy is taking care of the riders’ aches and pains for free.